With a 200km range, network connectivity and Tesla smarts under the bonnet, it sounds like a mean green driving machine. But is it? T3 took it for a spin in San Francisco to find out if it lives up to its promise. The five seater B-Class is the latest model to join Mercedes electric car line-up, plugging into the grid next to the SmartEV. Based on the standard B-Class launched back in 2011, Mercedes-Benz has once again teamed up with electric car experts Tesla to create a B-Class sibling that offers a zero local emissions drive. Let's be clear, it's got some tough competition from the get-go, taking on the much lauded BMW iSeries. So is it a breakthrough car that'll convince us to leccy? We took it to the green streets of Palo Alto and San Francisco Bay wine country to find out. The electric engine innards that Tesla helped design are powered by a high performance lithium-ion battery tucked away under the floor of the car. The system gives the B-Class 130KW power, which equates to 177bhp, 340 newton metres of instant torque - the same levels you'd get from a three-litre petrol engine - and hits 0-60mph in 7.9 seconds. It'll also clock up a healthy range of 200km off a single charge. Meanwhile the top speed is electronically limited to 160km/h. But this car isn't just about setting the electric agenda, the B-Class is also digitally networked enabling what Mercedes describe as 'remote interrogation and remote configuration.' To you and me, that means you can access your car and its vital information anywhere, from your smartphone or a PC. First question on our mind as we get a first look the brand new MyElectric smartphone app - powered by the Mercedes mBrace technology - is why would you want to control your car remotely? Well, for a start, it means you can do clever things like fire up the climate control to pre-heat or pre-cool the car ahead of your arrival. Unfortunately the current iteration means you can only do this to a single preset temperature, preset not by you, but by Mercedes. Having a man in a lab dictate your perfect car ambiance feels a little odd. This really needs to be customisable, preferably for each driver to make it genuinely useful. The app will also show you how much charge is in the battery and how far that'll take you. This is all cleverly displayed on a route map with a clever graphic the German engineers lovingly call the 'range potato'. This takes into account road conditions and terrain to give you accurate data on how far you'll be able to drive based on the current charge levels and your driving. It also flags up where you can recharge on the way, helping to take away some of that range anxiety that comes with owning an electric car. Remote locking and unlocking, car locator and expected charge completion are also features of the app. This kind of thinking makes sense as the smartphone becomes another brain for you connected car. In subsequent iterations we'd expect to see recent journeys, blow-by-blow stats on your driving efficiency for each journey and things like the ability to send points of interest and destinations direct to the sat-nav or have the radio switch on your favourite station the moment you jump into the car. The new B-Class Electric Drive can be charged from any domestic power socket, although Mercedes admits this isn't the most efficient way to get your car fully fuelled. Charging at home is tipped to take 'overnight'. For a faster charge you'll need to install a new charging unit, most likely on the front of your house. On the Mercedes-installed 400v wall charger, 1.5 hours of charging provides 85 miles or 100km range and that means additional cost, although there's no info yet on what that might be. Plugging in isn't the only way to re-juice. The B-Class Electric has smart braking systems that convert the kinetic energy you create when slamming the hammers down into electric power, feeding that back to the battery for added efficiency. There are also three battery regeneration methods that mimic the effect of taking your foot off the accelerator in a normal car and uses the inertia in slowing down to recharge the battery, helping capture lost energy. The first is achieved by taking your foot off the gas. The second by using the shift paddles in the US car. Third is the smart radar-based system, which doubles up as automatic braking. When a car slows down in front, the B-Class uses regeneration to slow the vehicle, saving you from putting on the brakes in some situations. Mercedes has tried to help you overcome your range anxiety - the fear of conking out half way to your destination - with Extended Range Mode. This unlocks 15 per cent extra battery capacity, but you have to hit the button to make the most of this before you finish charging. So it's a pre-emptive strike against battery outage rather than a oops-I'm-about-to-break-down safety net. There's a caveat too. Use this feature too often and the life expectancy of your battery drops. You'll also have to pay extra for this feature as part of a Range Plus package that'll set you back a tidy 800 Euros. With most of the tech innovation in the B-Class Electric focusing on making a better electric experience, don't expect too much from the in-car. It's all fairly basic stuff. The standard equipment package includes the Audio 20 with a 14.7cm colour display, twin tuner and MP3 compatible CD player as well as USB port for all your smartphone music needs. There's built-in sat nav powered by Becker Map Pilot and if you want internet access and voice control you'll have to pay for the optional Comand Online multimedia system. Thankfully Merc has offered a little more when it comes to safety. 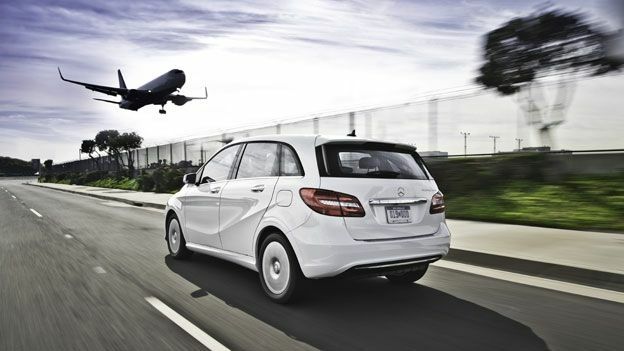 The B-Class comes equipped with a radar-based collision prevention system and adaptive brake assist. These systems work to spot potential obstacles, provide visual and audible driver alerts and eventually help with braking if needed. Blind spot assist, lane assist and park assist are all on offer as optional extras. Putting the logistical question marks around electric to one side, the B-Class Electric does drive well. There are two optional drive modes, Sport and Eco that make it possible to customise your drive giving you the choice between range-busting caution and fewer miles, but arguably more fun with a devil-may-care driving approach. Switching between these options isn't over complicated, but in all likelihood most people will stick to a single mode for unplug-and-play simplicity. In Sport Mode there's a decent amount of punch (132KW of power when you put your foot flat to the floor) that makes it a city car that could hold its own venturing onto the motorway. This will cost you range, though. Mercedes predict up to 10 per cent. If the future of your motoring is electric, then the Mercedes B-Class Electric Drive would be a solid option but for one thing - the price tag. We're still waiting on UK prices but at over $40,000 this isn't a cheap second run around - even if you factor in the government's £5,000 electric car grant - and that's what most electric cars need to be. With a range of 100km it's not practical to use this for long runs. Paying extra for a charging unit and the installation will also be a barrier for most. If you're looking for a cockpit laden with the latest in-car multimedia and cutting-edge tech then this probably isn't for you either. Eighty per cent of the smarts in this motor are under the hood. It does the basics well with an easy to use nav set-up, adequate wired and Bluetooth connections for your iPhone or Android but don't come looking for Apple CarPlay just yet. What really excites us is the fact it's networked and the innovation packed into the new smartphone app. This is genuinely new frontier stuff, a nod to how we'll control and customise our cars in the not-too-distant future.